Did you ever think about how the Communion Wafers used at mass are created? According to church doctrine, the wafers must be made only of pure wheat flour and water. 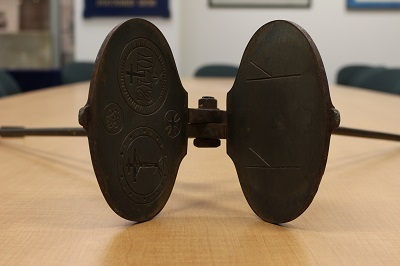 Traditionally, the dough was rolled out flat and squeezed between the two iron plates of baking tongs, such as the example from the Archives pictured below. The plates are embossed in order to separate the wafers from the rest of the dough and add decorative designs. 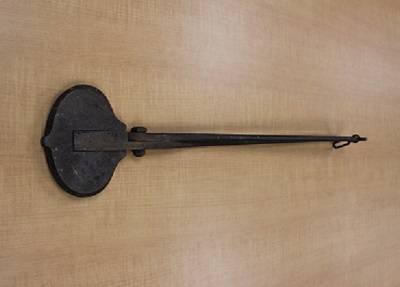 Originally, a parish would choose a particular baker from the community who was sanctioned to produce the communion wafers using tongs like these. Later, the task of baking the wafers was taken up by cloistered nuns, who were able to produce the wafers on a larger scale and generate income for their convents. Today, 80% of the wafers in the US market are baked on large scale industrial equipment by the Cavanaugh Company of Greenville, Rhode Island, which boasts that its wafers are “untouched by human hands.” Some convents also carry on the tradition, and have found other ways to compete with private industry. The Benedictine Sisters of Perpetual Adoration in Clyde, Missouri, now produce a low-gluten wafer that is safe for consumption by parishioners with Celiac disease.